The Tallest, Largest & Oldest in the world! Tall coastal Redwoods, massive Sequoia trees in the Sierra Nevada mountains and the oldest living things on earth, the Bristlecone Pines. Yep, they are all here, all in one glorious state ----- California, where else? 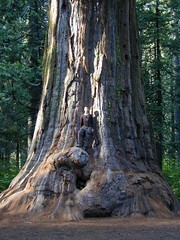 The Sequoia is part of the Redwood family of trees. These huge trees have massive trunks which have shallow root systems, so you won't find too many campgrounds/tent spots on the base of these beauties. The Coastal Redwoods tower high above the blue Pacific, growing in fern lined canyons & more often than not, under a foggy layer. Most of these groves are located in Northern California, but a few located on the Central Coast get recognition. 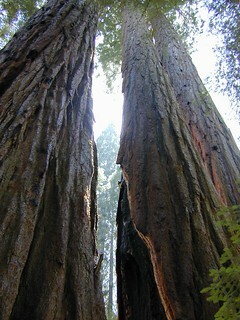 There's rumor that Los Angeles even had one small set of Coastal Redwoods, that is - if the smog hasn't killed them yet. There are plenty of parks with these tall "Coastal Redwoods" - some located inland, twenty-something miles from the ocean. The Sierra Nevada mountain range has some serious dimension, granite spires, deep river gorges, along with the largest trees on the planet. Hiking around thousand year old Sequoia Groves will put it all in perspective. The Central Sierra is where to find these. 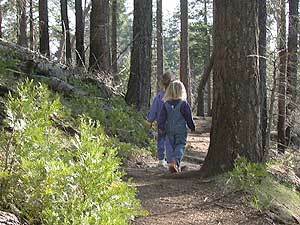 There are several parks and places to see Sequoias. Northeast of the Owens Valley & Bishop, atop one of the tallest peaks around, sit the Ancient Bristlecone Pines. This little-known park gets over looked my many heading the Eastern Sierra. Mammoth Mountain is a huge tourist destination nearby, but the quieter White Mountains have the darkest nights skies, off roading, aspen groves & the real wilderness seclusion you may be looking for. 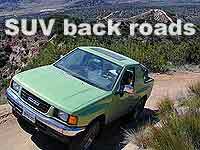 No longer can you drive right up to the Bristlecone Groves. The parking lot has been moved well away from the fragile trees, and your'e gonna hafta hike it a little (at high elevation), so bring the sturdy shoes. gathering peagae from the bark of this old tree. and some looked upon me with a greedy eye. to create their living quarters. and still I didn't die. the branches of this old tree. until the day a logger's saw laid me to rest. and the next generation will have to pay.